LLECHRYD finished runners up in this years’ Alan Brown tournament as they were beaten by 98 runs by Saundersfoot at Whitland. Paul Mansbridge and Sam Franklin got Saundersfoot going in their first innings with Franklin scoring 31. Danny Caine finished not out on 21 and Paul Mansbridge not out on 44 as Saundersfoot reached 138-3. In reply , John Curran made an excellent 50 for Llechryd before he was bowled by John Mansbridge. Tom Mansbridge also took four wickets while John also claimed a second wicket. Mike Godfrey made a late score of 15 for Llechryd but they reached 108-8 from their first innings, to trail by 30 runs at the half way stage. In their second innings, Saundersfoot made an impressive total of 153-5. 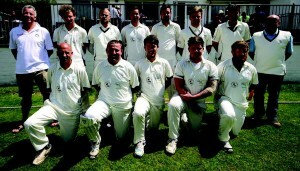 James Caine scored 24 before he was bowled by Rhys Beard , while Paul Mansbridge was amongst the runs again this time scoring 34 before he was also bowled by John Curran. Sam Franklin made 36 while John Mansbridge finished the innings not out on 23 along with Simon Stanford who added four. That meant that Llechryd would need to score 184 to win the final but after a promising start wickets fell at regular intervals. John Curran made 15 and Rhys Beard made 20 before both were out , while Mike Carter was trapped leg before wicket for 0. There were scores of 11 from Gwion Howells and Mark Newell , and Adam Betts made 12 before he was bowled by Neil Powling and no other batsmen made it into double figures. Powling claimed another wicket while John Mansbridge took two late wickets as Llechryd limped to 86 all out. That handed the Alan Brown trophy to Saundersfoot who were delighted with their victory.